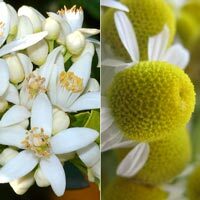 Neroli Chamomile – Essex County Naturals. A soothing tranquil unity of Tunisian Neroli & Hungarian Blue Chamomile essential oils to pamper the senses and delight the skin. TIP: Combine a matching soap, bubbling bath melt, skin butter, mineral body salt, body scrub and room fragrance in the same aroma to create your own Neroli Blue Chamomile scent line.